The River Witham Viking sword is perhaps the jewel in the crown of Generation 2s sub US$300 production swords. This is the second sword in the Hank Reinhardt Collection from Imperial Weapons. It is based on a sword that was found in the Witham River near Lincoln, England in 1836. 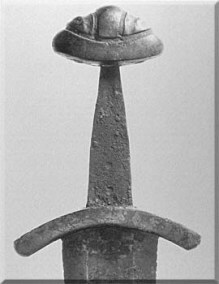 This sword now resides in the British Museum. Viking Sword - Tenth Century A.D. - The original sword was dredged up from the river Witham. 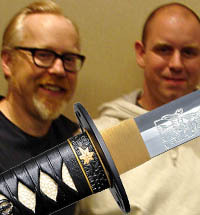 "This sword is one that I have wanted to copy for years. There have been several attempts, but none have completely satisfactory. Adequate, yes, but not truly satisfying. At least until this one. Several years ago I had the chance to visit Sweden and Gotland to look at Viking artifacts as well as the remains from the Battle of Visby. One thing that I noticed, but have not encountered in any works on the Viking sword, is that the Swedish swords all seem to be a bit large than those I saw in Norway and Denmark. Of course it could have been just luck that the ones I saw in Sweden were larger, I have no way of knowing. But this sword could easily qualify as a Swedish sword. The blade is 77.8 cm, and is slightly over 6cm wide, and the balance point is about 16 cm. from the grip. 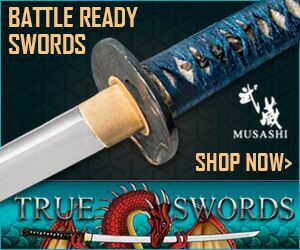 This is a true warrior's sword, the weight is about 3 pounds, but the balance is superb. The cutting power of the sword is quite impressive and I can easily see it being wielded by Skarp-Hedin or Egil Skallagrimson. Hand forged, high carbon steel." I had seen pictures of this sword well before ordering it. To tell the truth, I have had experiences in the past where I would see pictures of a sword that looked just beautiful, but when I had an actual example in hand, it was a bit of a letdown. That is definitely not the case with this sword. If anything, Clyde's early pictures did more to hide the beauty of this sword than to show it off. It is truly a beautiful sword that pictures don't really do justice to. I really do have to rave about this sword as I like it so much. 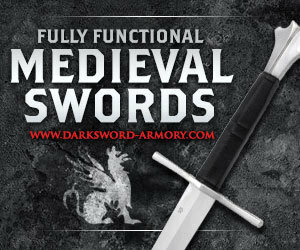 The pommel and guard are made of brightly polished stainless steel on this first run of swords. This contrasts very nicely with the copper diamonds which measure 1/4-inch wide and 3/8-inch long. These diamonds are inlet into both the pommel and guard. I was afraid these would be gaudy, but that is not the case. 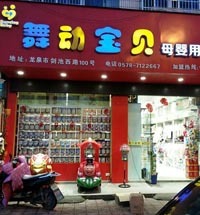 However, they are definitely distinctive. There has been some discussion that the guard and pommel of at least some subsequent production runs may be iron or carbon steel. 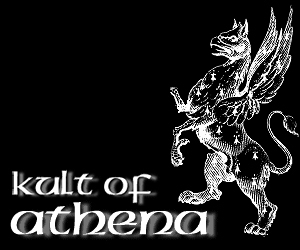 I for one would love to see this made with iron as the originals were. Then I would use salt water and vinegar to antique the whole sword and possibly clean the copper back to a shine. The grip is four inches long and is covered in black suede. This is definitely not historically accurate as suede is a modern invention, and the length might be a bit longer than historic examples. 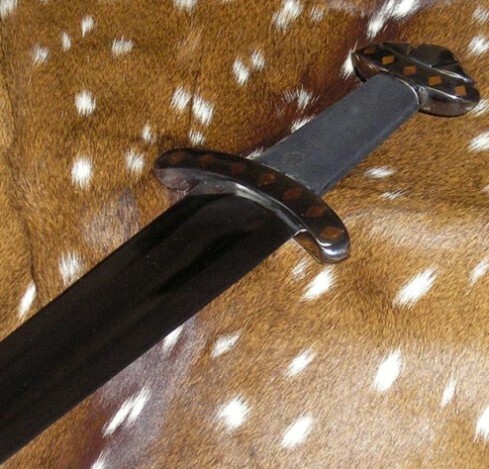 However, for a cutting sword the suede grip is both comfortable and secure, and the length of the grip allows the modern user's hand to actually fit the sword instead of wrapping the little finger over the pommel. 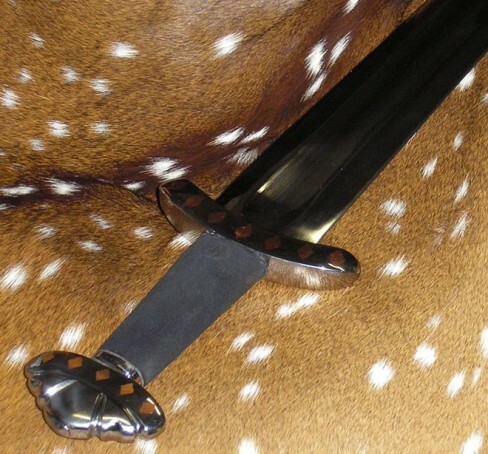 The sword exhibits a high degree of polish and finish work. The pommel, guard and blade are all polished to a mirror finish and seem to be devoid of grinding marks and any other blemishes. The metal "washer-looking" plate of the Generation 2 line is present at the rear of the grip, and along with the suede, is just about the only thing "modern looking" about the sword. The fit and finish of the blade is very nice. The wide fuller runs most of the length of the blade. 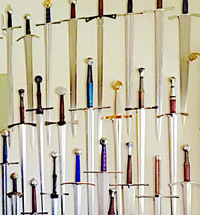 The only areas where the blade diverges from historic Viking swords is in the fact that the fuller stops just before the guard instead of extending under the guard, and the point shows that the blade is somewhat of a flattened diamond cross section instead of lenticular as real viking swords were. I intend to file off the defined ridge between the fuller and the tip and repolish that area of the blade to get a slightly more historic look. 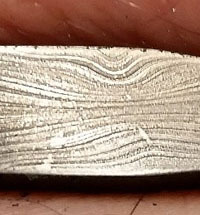 The tip of the blade shows a good profile that contours into a sharp tip. While most viking swords had a more rounded tip and were not intended for thrusting at all, the Witham River find had a definite point to the tip that would facilitate the thrust. Here, the Generation 2 sword is true to the original. 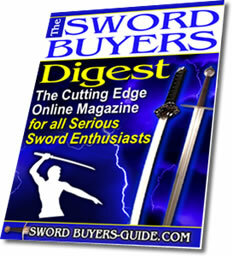 The sword comes with a wood core scabbard, wrapped in black pigskin, and having a polished steel tip and chape. This is definitely unlike any real Viking sword scabbard. It looks distinctly modern, or at least late middle ages. But on the up side, it fits the sword reasonable well and protects the blade. I am considering doing a leather wrap over the top of this scabbard, with triangular leather flaps at the scabbard mouth and a historically accurate belt system. This would complement the sword nicely. 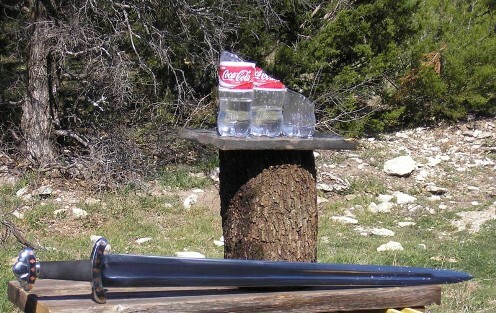 I began my testing as usual by cutting some plastic soda bottles filled with water. I was eager to see how this promising blade would handle. With a point of balance (POB) at 5 3/4 inches it has a distinct cut orientation, but still evidences a bit of subtlety at the same time. Changing blade direction is not too difficult, especially for a 3 lb. single hand sword. I normally start with one bottle to get the feel for a sword. 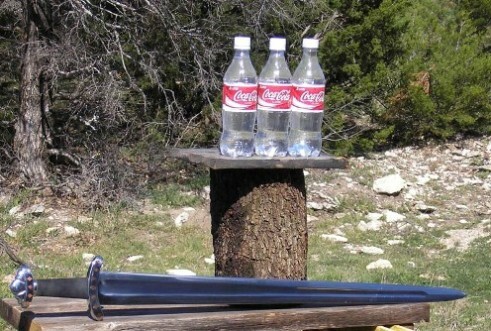 Then I would progress to two bottles, doing several cuts at each stage. 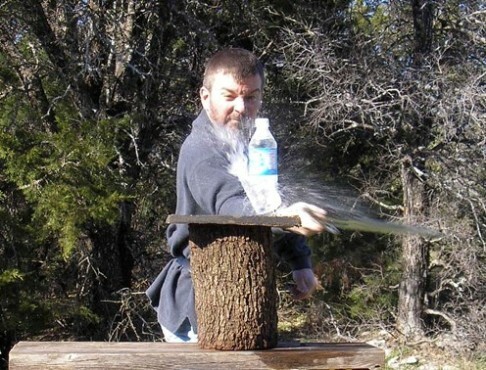 But I had such confidence that this sword would cut well that I started with three 20-ounce soda bottles. Accelerating the blade into the cut was a lot easier than I expected. The cut through three bottles was very smooth and almost effortless. As you can see very nice, clean cuts followed. I also tried it out on one gallon jugs, starting with three jugs. These are much easier to cut than small soda bottles, but they look cool. The cuts were so easy that I made a couple of passes at these jugs, cutting 2-inch slivers off with each pass, and leaving the remaining portion of each jug completely full of water. 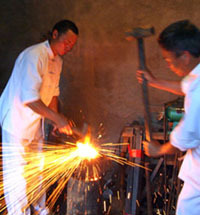 In fact, I liked cutting with this sword so much that I must have spent three or four hours cutting bottles and jugs. I don't know how many bottles and jugs I cut. But I had two large garbage cans completely full before moving on the the next phase of testing. Here you see me cutting a single bottle. Believe me, it took a lot of tries to get this stop-action, thus I was reduced to using single bottles so I wouldn't run out before getting a good shot. The ugliness of the expression is just me most of the time (I got an ugly mug). The squinting is from the spray of water into my eyes on this particular cut. I became so comfortable with this sword that I was able to successfully attempt several double and series cuts, where I cut a set of targets multiple times. Please pardon the pitiful video quality and my OBVIOUS lack of talent. And as a testament to its cutting power, see this closeup of an example of my occasional lapses in accuracy. This is a Gatorade bottle, one of the toughest plastic bottles to cut, IMHO. You can see I struck the bottle at the center of the neck where it's thickest, but this impressive cutter went cleanly through all that thick plastic with a clean cut and the bottle behaved as if the cut was a good one. I have begun using cutting targets from (the now defunct company) Swordfodder.com to do the serious cutting portion of my tests. I like this target because it is consistent and easy to setup and use. It is also a snap to clean up when done. And it hasn't posed any hazard to my blades. As far as serious training goes, their Master Target is unforgiving of any type of bad technique. "For such a light substance, it can really grab a sword in mid-cut if you let the edge control lapse..."
And I do that occasionally. Here you can see where the sword blade lost it's slicing motion and the target stopped the sword and held it, silently saying "Hey dummy! Gotta keep that blade cutting. This ain't no meat cleaver." One of the things I really like about this target is that if you practice your accuracy, you can get 20-30 cuts from a single target. The objective is to slice off little 1 or 2 inch slices. Which is certainly easier said than done with a single handed. After wearing myself out enjoying this sword, I even tried a bit of multiple cutting with the swordfodder target. While my accuracy wasn't up to par for slicing off little 1-inch slivers, well...gimme a break. My forearms were crying by this time. The last section of the testing consisted of vigorously attacking the tire pell with roughly 100 full force strikes. At this point, my forearms were beginning to get really tired. I concentrated in landing blows with the edge beginning at the midpoint all the way out to the tip. honestly, at this point I just wanted to finish the testing. But dutifully, I landed the blows with force even though had to alternate left and right handed to keep the blow forceful. After this 100 strikes test, all fittings are still tight and no sign of loosening is present. The blade tip is more rigid than I expected on a Viking sword, and it is very sharp. Getting it to penetrate the side walls of tires during the thrusting test was not difficult at all. Preferences: I would prefer the guard and pommel be made of iron. (Editors Note: After this review was first written, Clyde from Generation 2 did indeed change the hilt to carbon steel). I would like the grip to be pigskin wrapped, though the suede works well for cutting. And I really wish the scabbard was more historically accurate. And I think both grip and scabbard would be more attractive in a lighter earthtone color like light brown, oxblood or just distressed leather. On the up side, this sword probably handles better than any other Generation 2 sword I've tried. And did I happen to mention...IT'S DOWNRIGHT BEAUTIFUL! Let me just be honest. For $299 I really like this sword. If the next round of these swords comes with an iron guard and pommel I will save up to buy another. 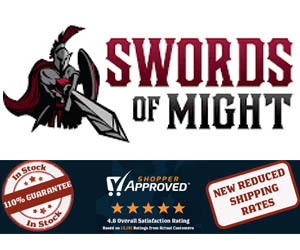 And that's just about as good a recommendation as I can give to a sub-$300 sword. I hope this review of the Generation 2 Witham Sword has been helpful. 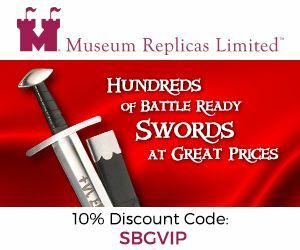 To return to Modern Replicas of Viking Swords from River Witham Viking Sword Review, click here.